The Wai Lana Yogi Yoga Mat is designed to provide a safe and comfortable foundation for any yoga workout! 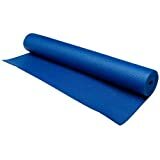 This yoga mat features a sticky, non-slip surface for superb traction and extra support. It cushions the spine, knees, ankles, and elbows throughout those uncomfortable poses. The Yogi Mat is also latex-free, lightweight and easy to wash. Choose your favorite from a variety of colors!